Carol was in hospital waiting for surgery to repair her failed new fistula graft. Storm Callum and I was on my way to the Lake District after work. On the way I passed a tree that had fallen and squashed a car, miraculously no-one was hurt. Because I had to pass Tebay services, I also had to get out in the teeming rain and buy provisions for the next day. And also because it was a ritual that Chris and I stopped at Tebay whenever we could. I got to Mosedale End Farm B&B just after 6. It’s beyond Mungrisdale (pronounced mung as in bean and Grizedale as in Grizedale). There is more road beyond the farm but it felt like the end of the line. The farm backs onto Carrock Fell which looms steeply over it. I’d like to return to climb the fell especially as the B&B is fully geared up for walkers with an honesty fridge full of sandwiches and various other snacks, and a boot room. I rang Carol who had finally had the surgery. After settling in, I drove the 2 km back to Mungrisdale. It was very dark by then and very wet. The Mill Inn was quiet. Chris and I came here back in 2011 but it felt like yesterday despite the weather being totally different. And that time we stopped at Tebay on the way home after summitting Grisedale (with an s) Pike! I had a chicken curry which was fine and some Cumbria Way beer, very good beer. Carol and I came to Bowscale Tarn in 2010 but not the pub. Back to the B&B to watch Never Say Never Again. And never watch it again either. Twice is too many times. Good breakfast is somewhat dark and gloomy room. Lots to eat, homemade bread. I had a poached egg and baked beans. JoAnne was a good hostess and let me get on with what I needed to do, i.e. get to the course on time. It was still raining very heavily but I only had to go the 2km to Mungrisdale Village Hall. There were 6 of us on the course, run by Andy of GPS Training. I’d recently bought a Satmap GPS device and the course was just for Satmap GPS units. Andy was excellent and knew his way round the 3 different models. It was raining so much the river rose during the day so we only went out briefly a couple of times. I can’t fault the training and now feel much more in command of the unit and what it can do. There’s also a year of access to an online resource. Andy has done loads of video resources to answer any possible question you might have!! I had a short chat with Carol before leaving for home. It had been a good use of my time as she was out of action, but I was nagged by the underlying anxiety of the surgery. I got home Saturday evening and then broke Carol out the next day. Surgery successful. It was very much still winter on this Wainwright fell. I started from Ashness Bridge and plodded my way up the side of Ashness Gill. It was cold but I was able to see for the first half of the ascent and then visibility went down to about 10m. I got to the top of the fell where it was less than that! Back down and it was nice to come out of the cloud and snow and to look across to where I was staying at Derwent Bank on Derwent Water. A good warm up walk to get me back in the swing of it. I stayed in an HF Holidays house, it’s the UK’s only cooperative holiday company and it was excellent. So good that I became a member after one night, the room was good and the food was great. Good journey. After taking in enough bags (Carol) for several weeks we had a light supper and walked down to Esthwaite water in the dusk. Lovely. Big breakfasts. To Coniston for a look round then up to the Coppermines and then on to Levers water reservoir now part of Coniston hydro electric system. Quite a hard walk for my party (Carol) who did very well. Picnic at Levers water. Back down we stopped for a cup of tea with the Jetboil at the end of Coniston Water. Back to Belle Green B&B to get ready to go to the Tower Bank Arms. We managed to be late even though it is only 2 mins walk away. No excuse for us having to wait over an hour for our dinner. Carol had pork fillet with black pudding mash and veg. I had y m2nd choice of ratatouille with sweet potato mash on top and tempura veg. The food was nice but we were hungry tired and cross by the time it came. What I’ve got to walk all the way down as well?! More big breakfasts. To Ambleside for the shops! Then to Browfoot just north of Staveley for a flat walk along a river. Very peaceful. Lunch overlooking Kentmere tarn. Back via ferry which now has stupid ticket machine system instead of buying ticket from man on board. Very complicated machine which made me want to hit it. Machine has not resulted in fewer jobs as there is still a man to check tickets and a man to direct cars as to where to go. Meaning the machine is total waste of time and will make people very cross. It seemed to be succeeding well with this aim. Back to B&B to get ready to go out to the Blacksmith’s Arms at Broughton Mills. This is a very nice old pub with good food and the excellent Tirril Brewery’s draught Pennine Pilsner. I had 2 halves. Carol had grilled chicken with and I had pea risotto with a poached egg on top. C then had sticky toffee pudding and I had a sort of lemon mousse with a piece of shortbread. All very nice. Back via lovely quiet lanes. It didn’t look that bad! C did the inspections. Asked which she would prefer. None of them! Decided to buy some small snacks instead as both quite well fed now. Drove to Broughton in Furness. Unfortunately the nice bakers is closed on Mondays but we got some bits in the grocers and the butchers which had various samosas, pakoras etc. We had a drink in a cafe on the square. Drove back through Broughton Mills passing the Reading Room car park which would be a good place to park when visiting the pub which has only room for 3 cars in front of it and no car park of its own. Parked on the little road to Torver and walked a short circuit down the road along the beck. Very quiet, saw 3 people. Stopped for lunch at a named hamlet which is just a handful of ruined houses. Started to rain but just a shower. Back up the hill through the forest. My party struggling a bit as quite a while since dialysis on Friday and the cumulative effect of a smaller volume of dialysis since the fistula repair operation. She did well and is expecting to be full of beans once back on the regular regime. I hadn’t really appreciated how this all worked. Drove back to Near Sawrey stopping for a cup of tea brewed up on the Jetboil. I think this is “hurry up and take the photo”! And we worry about chemicals in our food now. It’s a strawberry for Little Ted! Sometimes not sleeping much is useful. I managed to park in the NT car park at New Dungeon Ghyll and was walking by 9.30. There was a bike race on which worried me a bit about the parking but the NT was fairly empty. 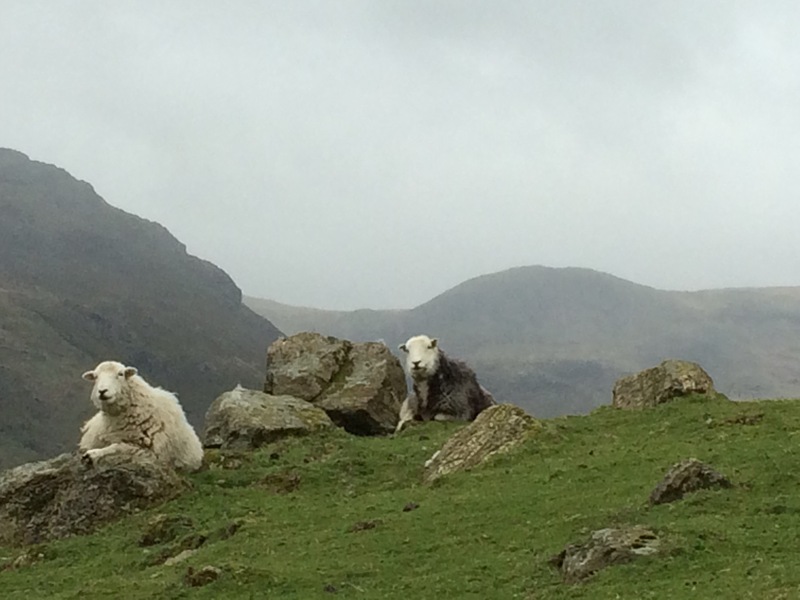 I pushed up to Pike of Stickle to meet sleet, hail, wind, sun, mist. I didn’t do the last 5 metres because it was hands on scrambling and the Rock was wet cold and slippy. 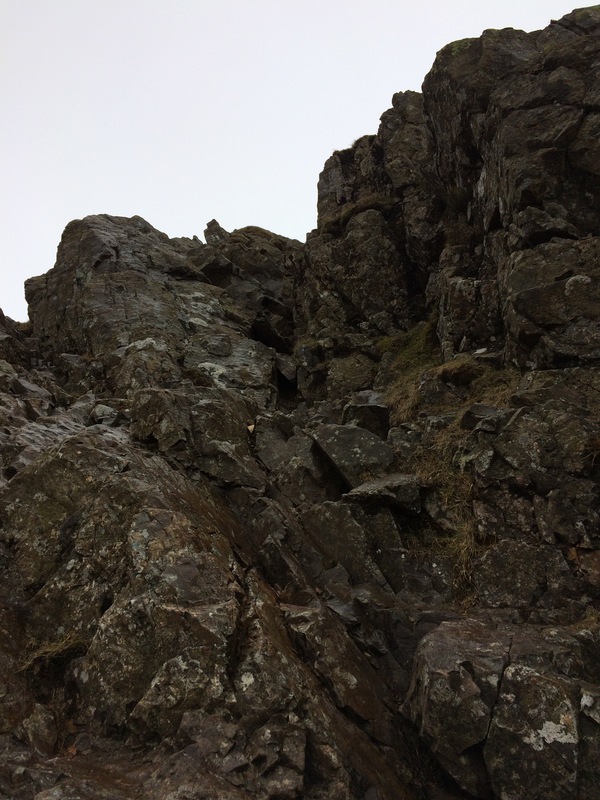 Then to Harrison Stickle. Good views of a lot of lakes. Back to the col and some tricky nav to Thunacar Knott. 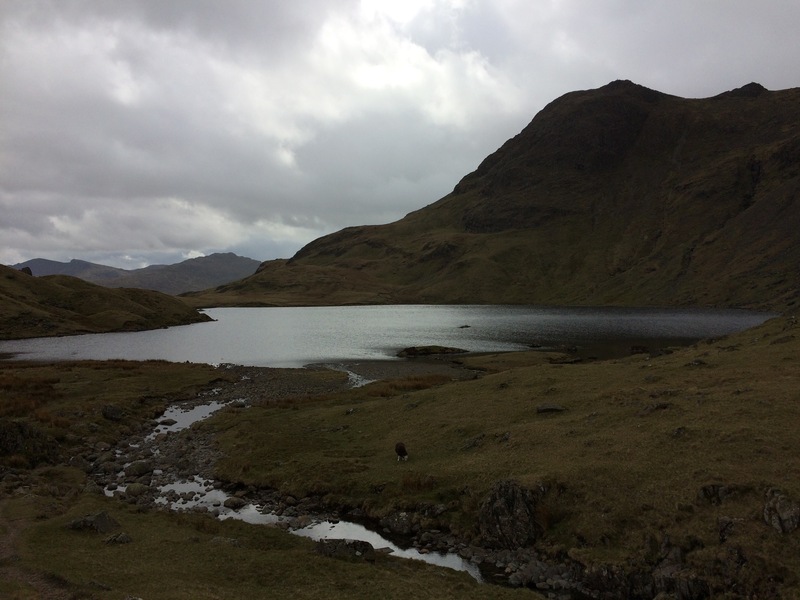 I decided to forego Sergeant Man and headed off to Pavey Ark and back down to Stickle Tarn and down some more to the car. My knee was hurting which was in part because the steps were huge. Back down in time to get home in good time and serve up a delicious boeuf bourgignon which had slow cooked all day. Today’s walk plan was to knock off some Wainwrights at the back of Blencathra. I parked up in Mungrisdale on the road verge after an easy journey of 2.5 hours without stopping for coffee. Set off at 10 a.m. Pleasant and easy walk to the top of the crags along a wide path. It was dry but blowy at the top. Down a little to a col which joins the Crags with a spur off Blencathra. At this point I veered off and headed due west to Mungrisdale Common. Wainwright must have been having a joke here, his description starts off with “To add to its other failings …..”, continues with “has no more pretension to elegance than a pudding that has been sat on” and “There is little on these extensive grass slopes to provide even a passing interest for an ordinary walker, and nothing at all to encourage a visit.” So why the bloody hell did he bother to put it in, it’s not even a summit as such. There is a suggestion that it was put in to provide some filler for the book on the Northern Fells. The common is a large, flat stretch of featureless bog. And very tedious because the bog got boggier and boggier as I went along, reminiscent of the bogs on the Isle of Jura. It started to rain so once I’d been and found the “summit”, I squelched my way back stopping for lunch on the way after I’d got off the bog. Not a soul in sight on the common. Back at the col, I went down the River Glendaramackin to reach a footbridge. Over this and then quickly up onto Souther Fell. The rain was coming in fast over Blencathra by this time. There was a path marked on the map which would take me directly to my car so I aimed off but crossed it without noticing (probably because too faint). So I headed back up a little (I’d overshot the distance) and then located the path in the bracken. This now brings my total of Wainwrights to 74 which is properly over one third of them done. Five and a half hours of walking. Home by 6 p.m.